According to the Constitution Ukrainian is the only official language in the country although Russian is widely spoken as well. Ukrainian language dominates in the West while Russian in Eastern and Southern regions of the country. In Kyiv, capital of ukraine, Russian is more often in everyday life although Ukrainian is used in official institutions. How did it happen that two languages are almost equally significant in daily life of Ukrainians? Probably the best answer is “History“. It worth noticing that three Eastern Slavic languages (Russian, Ukrainian and Belarussian) evolved from Old Slavic used in medieval state of Kyivan Rus. 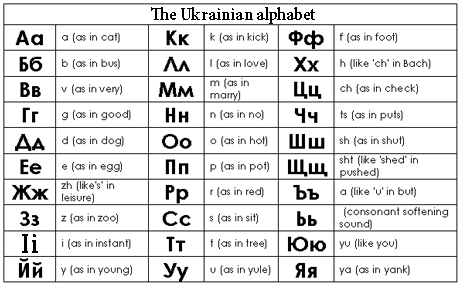 Ukrainian language was developing on its own and became to be influenced by Russian once “the Northern brother” became agressive occupation in 18th century. Some time later Ukrainian was banned in Eastern regions of the country controlled by Russia while Ukrainians in the West enjoyed liberal Austrian rule. Finally after Soviet Union occupied most of Eastern and Central Ukraine a lot of Russians and other nationals from Soviet republics fled into Ukraine to build new prospective socialistic state. As a result approx. 17% of Ukraine population are of Russian origin. Which language to use: Ukrainian or Russian? Both languages are equally understandable and accepted throught a country. It often happens once somebody ask in Ukrainian receiving responce in Russian or reverse. Although it might be more polite switching to language of cospeaker. You might hear from people that no way you speak Russian in Lviv or other part of Western Ukraine. Otherwice you’ll be treated badly or even attacked by locals. Lady in the shop won’t sell you water and taxi driver will take you out of town. So, if you know or study any of these languages don’t hesitate to practice it. Local in every part of the country will be happy to help you by maintaining conversation. At least one foreing language is obligatory in every Ukrainian school. Most children start studying foreing languages from the age of 6-7. In about 75% cases English is main or the only foreing language tought to students. Then by decreasing German, Frensh and Spanish. Unfortunately it doesn’t mean that most of young Ukrainians speak English fluently. I’d say that about 25% of young people in cities speak English on intermediate level while in rural ares it’s unlikely you’ll have a deep conversation in English. Generally speaking in modern business life in Ukraine English is considered to be a “must”. It is a requirement on most vacancy positions and Ukrainian society is becoming more English mature every year. However you can always learn some Ukrainian phrases to make your trip easier.